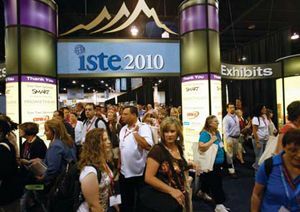 ISTE 2010 drew 12,792 attendees and 456 exhibiting companies to the Colorado Convention Center. Overall, there were signs that consumer and education technology are merging at an accelerated rate, and teachers are at the center of the trend. It also seemed as that anyone who could program a database was promoting a student information system or a learning-management system. And interactive whiteboards … well, they ruled supreme. Interactive whiteboards were far and away the single most dominant category in terms of booth space and presence. The category inexplicably keeps growing year after year and even drew new entrants at ISTE, such as eInstruction, which showed its Interwrite DualBoard. A stunning 64 ISTE exhibitors identified themselves as being in the interactive-whiteboard product category, and—even allowing for those who check every category— that’s still roughly 14 percent of all exhibits, a presence made more prominent by the fact that the interactive-whiteboard companies tended to have huge booths. One reason for the prevalence of interactive whiteboards is that they aren’t all about just the whiteboard anymore. All the interactive-whiteboard exhibitors appeared to have student response devices—from traditional “clickers” (with or without displays) to full tablets—and everything was tied to the interactive whiteboard. SMART Technologies and other companies were also showing how iPhones and iPads could be used as student response devices with their systems instead of a dedicated proprietary tablet. Interactive whiteboards are adding 3-D features. SMART, Promethean, and others showed interactive whiteboards with projector-embedded 3-D technology (and yes, with required 3-D glasses). A rep with Texas Instruments, which provides underlying 3-D DLP technology, said that more than 12 manufacturers and 100 products were using TI tech inside. There is interactive-whiteboard technology that doesn’t require an interactive whiteboard. Long-timer Mimio, which started in the corporate market a decade ago, showed MimioTeach (http://mimio.dymo.com), a small bar that magnetically attaches to any whiteboard to wirelessly capture whiteboard activity to a computer and projector. Its relatively low, $799 price tag gave it some buzz factor on the floor, presumably among cash-strapped schools. Another approach seen on the show floor was to put all the technology into the projector and none on the whiteboard to make it interactive. Epson America was one exhibitor taking this tack, with its IU-01. The technology, which attaches to a personal computer via USB, simply senses and tracks activity from the projector itself and communicates that activity to the computer. It has the potential to completely displace dedicated interactive whiteboards. Dedicated social networks for students (and educators) were a mini trend at ISTE; at least three companies showed new products or new features. These were in addition to Pearson’s announcement just before the start of ISTE that it would underwrite educator communities on the general-purpose social network Ning. Perhaps not unexpectedly, the education-specific social networks have a Facebook-like look and feel. Edmodo (www.edmodo.com) launched in September 2008 as a social learning network and has a free edition for teachers and students. New at ISTE was an iPod application, and an Android app will be added this fall. Edmodo features education applications and a library of educational content contributed by teachers that they can share with each other; content partners will be announced by this fall. Edmodo says that more than 20 percent of its users visit every day. Schoology (www.schoology.com), founded in May 2009, also has free editions for teachers and students. It highlighted its difference at ISTE: a Web-based learning management system built under, and into, the social networking platform. TH(i)NQ Ed (www.thinqed.com) was the newest entrant, with its journ(i)e student-centered learning social network. TH(i)NQ Ed used ISTE not just to launch journ(i)e but also to announce the change of the company’s name to TH(i)NQ Ed from SchoolCenter. Journ(i)e has iPhone and Android apps, as well as a full set of social-network features including threaded messaging, blogs, feeds, wikis, and workspaces for projects and groups. It is also likely to give spellcheckers fits. Not on the show floor were teacher-focused social networks in which educators alone mingle, such as edWeb.net, TeachAde.com, and WeAreTeachers.com, which apparently ceded the spotlight during this ISTE to social networks in which students as well as teachers participate. The cool, fast Web research tool YoLink (http://yolink.com) announced a new API (application programming interface)—which is how its parent, TigerLogic, hopes to make money on the service—but the buzz was about YoLink’s free browser plug-in for enhancing and previewing search results (without having to click through links). Beamz (www.thebeamz.com) showed laser hardware that allows anyone to “play” music by breaking one of four red laser beams with his or her hands in the U-shaped device. Software indicates which note was played. Cost? $199 for hardware and software combined. Think Guitar Hero with education chops (those in the industry long enough can think Broderbund’s Jam Session with hardware). Vocabulary-builder site Learn That Word (http://learnthatword.org) is worth noting primarily because of its unusual business model. It charges schools not for all the vocabulary words from the site they use but only for the words it turns out that students don’t know and have to learn. More detail on the model is on the (beta) Web site. Cengage Learning had the dubious distinction of having what seemed to be the only booth with a large display of actual books. Mostly about technology. It seemed so very retro. Frank Catalano is the principal of Intrinsic Strategy (http://intrinsicstrategy.com/about-intrinsic-strategy), a strategic-marketing and business-consulting firm for education- and consumer- technology companies. What did you learn about helping students? I like a good edtech conference as much as the next geeky educator. But at the end, I want to look back at what I can share with the educators I work with. YOLINK blew me away. All their lessons and slide decks are shared on the site we created for the conference. CRITICAL-THINKING AND INTERNET-LITERACIES WIKI (http://critical-thinking.iste.wikispaces.net/) The concepts presented here are based on Howard Rheingold’s teaching: http://vlog.rheingold.com/. SWEETSEARCH4ME http://4me.sweetsearch.com/ Released in beta just before the conference, SweetSearch4Me is recommended for students in K-8 grade. Similar to SweetSearch, this search engine searches only Web sites that its staff evaluated and approved. The final site is expected to be released in September. ¦ Anyone can use technology; we don’t all have to be gurus. ¦ Everyone has expertise; we can all learn something from each other. ¦ A good teacher doesn’t have to know the indicators; he or she just has to know the content and understand how to get a student to learn it. ¦ Be aware of the culture. ¦ Get a clear conversation going. ¦ It’s always about the people, whether it’s students or adults. I didn’t walk away from ISTE with a miracle cure for any of those problems, but I did walk away with a renewed sense of commitment to children and helping them learn. Having attended the first ever ISTE/TIE Leadership Bootcamp, I was impressed with its lineup (while torn by the unfortunate scheduling conflict with EduBloggerCon). In truth, hopping during the day from LBC to EBC to LBC to EBC was fascinating because the events were structured very differently, both had good people contributing to the atmosphere, and each was unique in its strengths. The Leadership Bootcamp taught me a number of things. First, that I’m still comfortable with the relatively liberal filtering policies we put in place in our district. We put in adequate effort in maintaining CIPA requirements while also giving teachers and students the freedom to access social sites that might help their curriculums. Second, we’ve become an incredibly difficult society to teach—at least when “teaching” means “lecture”—and as students, well, we’re networked. Third, an increase in cost doesn’t always translate into an increase in learning. While the learning that took place at LBC was certainly topnotch (and traditional in its approach, to be sure), such an environment had no corner on the market of effectiveness. Fashioned on the “un-conference” model, EduBloggerCon, on the other hand, was free to all participants and informal in its approach. Session conversation topics and facilitators were selected at the beginning of the event, and no participants were paid for their services. Learning was the focus, and provided by the community for the community, all in the form of conversation, untainted by the sight of sages on stages. In jumping back and forth between LBC and EBC, I learned that conversation is an incredibly powerful method of learning and can be customized rapidly but that it is also prone to easy derailment. More than once, conversations began with a clear objective but quickly shifted to unintended topics. All in all, I would recommend both events.